Today SMI (Silicon Microstructures, Inc.) launched the new IntraSenseTM product line at the Minimally Invasive Surgery Week conference, sponsored by the Society of Laparoendoscopic Surgeons. 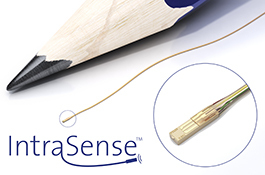 IntraSenseTM features biocompatible sensors that fit into 1-French tubing; the sensors are shipped with pre-attached and pre-encapsulated wiring to simplify integration. SMI also offers custom calibration solutions that can be designed to work with customers’ existing equipment. SMI has shipped millions of 1-French sensors for minimally invasive surgery, and the IntraSenseTM design represents a step forward both in sensor performance as well as ease of implementation. The IntraSenseTM product line will benefit minimally invasive surgical procedures by allowing pressure measurements directly in many spaces throughout the anatomy. It can move through tortuous anatomy to measure intracranial pressure, intrauterine pressure, endovascular pressure and renal pressure. Glaucoma monitoring, biopsies, emergency surgery and biliary pressure monitoring are other areas where the IntraSenseTM products could be used to provide the least-invasive monitoring available. Provided in wire-attached die form, these sensors can be retrofitted to existing laparoscopic equipment or allow new designs with smaller design rules. Calibrated sensors, which eliminate the need for autozeroing or calibration by the surgeon, can be integrated into the customer’s electronics or provided as a separate plug-in board. SMI is a member of the worldwide Elmos Semiconductor Group, offering proven solutions to a range of industries, based on application-specific ICs, sensors and complete microsystems. SMI is an ISO certified premier developer and manufacturer of MEMS-based pressure sensors for a broad range of markets, with over 25 years of experience. SMI’s design, production and quality control processes have enabled it to develop both the most sensitive and smallest MEMS pressure sensors available on the market today.